Attached is a photo of our newest family member, Zeigand Vom Kolenda. Zeigand, or "Z-man" as we affectionately call him, is a black & red GSD who was born on July 16, 2010. Zeigand will turn 5 months in 2 days, but this picture was taken when Z-man was just 9 weeks old. Hey, Joe. 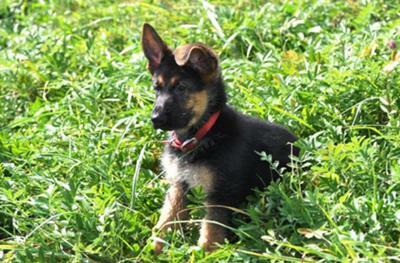 Thanks so much for sharing your story here today about your German Shepherd puppy "Z-man". That is a great picture of him too - he looks like a little booger too. I'm sure he can be quite a handful when he wants to be. Good luck with him.